Drawing to a close in Frankfurt on Thursday 7 May 2015, the twin fairs Techtextil/Texprocess surpassed all expectations. Organiser Messe Frankfurt had certainly done its homework, staging an industry event without compare. 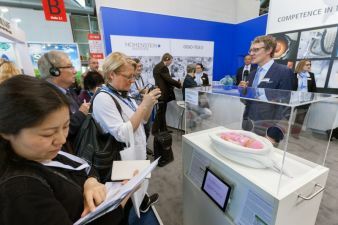 The sheer diversity of the products on show was mind-boggling, whether experienced "in the flesh" in Frankfurt or “virtually” through the website, blog, newsletter, Twitter, Facebook, app or film. Techtextil/Texprocess have certainly brought the future to the industry, tapping into every possible communication channel and showcasing highly innovative products. This is how it should be done! Just how the innovative and pioneering energy of our industry can benefit people in other sectors is demonstrated quite wonderfully by a product that we picked out and was awarded the Techtextil innovation prize (Category “New Application”). Developed by the Hohenstein Institute in Bönnigheim, Germany, “ARTUS” is the world’s first ever artificial womb. About 50,000 premature babies are born every year in Germany alone. Some of them need intensive medical care in incubators for weeks or even months. However, it has been known for some time that these premature babies miss the spatial confinement and prenatal sensory stimuli of the womb uterus). This lack can have significant consequences for these babies later on: many of the children go on to suffer from sensory or motor deficiencies as they develop, which have to be treated. 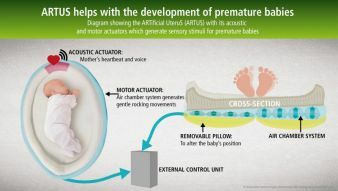 Now "ARTUS" can recreate the environment and sensory stimulation of a mother's womb in the incubator. As part of a research project (ZIM project KF2136730KJ3), the Hohenstein scientists have developed their first prototype. Acoustic stimuli like the mother's heartbeat and voice are transmitted to the premature baby, together with mechanical sensations like the gentle rocking experienced in the mother's body. A deeply moving, wonderful and ingenious innovation! Technical textiles helping to pave the way to a better start in life. What symbolism! Neonatologists, i.e. specialists in newborn and premature babies, are currently assessing the effectiveness of ARTUS for tiny babies by observing it in use. Project leader Prof. Dr. Dirk Höfer of the Hohenstein Institute believes that using "ARTUS" will allow the clinical condition of premature babies to be significantly improved: "In the first stage, however, we will be satisfied if we can just see a general improvement in the condition of the babies under observation. The functionality of our prototypes also needs to be optimised and modified for use in everyday clinical practice before the product is launched on the market. But we have already covered some key aspects. For example, the sensory Artificial Uterus can be washed with disinfectant, and the way that the mechanical stimuli are generated does not involve the use of electric wires which could generate harmful radiation. The specifications for a therapeutic medical device such as "ARTUS" are always demanding. Firstly, the material properties of the textile, such as its feel, elasticity and resistance, must simulate conditions in the womb as realistically as possible. The best combination of fibre and fabric structure must be chosen. The artificial uterus will also incorporate a mechanical textile actuator to provide the sensory and motor stimuli and sensation of equilibrium that will promote the development of the infant's brain. These earliest perceptions affect the whole of a person's subsequent life and are enormously important for the sensory-motor development of children born prematurely. From the medical point of view, these sensory impressions from the uterus should be provided to the baby immediately after its premature birth. Children born too early often find it hard to judge spatial distance, control their muscle tension or perform complex sequences of movements. The researchers are even going a step further in their project and incorporating the mother's heartbeat into the artificial uterus.